Sculpted by Marie Osmond for the Tiny Tot Collection, Eskimo Kissy is sure to stay warm and cozy in a cute interpretation of her native wear. Not only will her vivid blue coat with red and white faux fur trim keep her warm, but she plans to stay toasty with some sweet Eskimo kisses! Her head and hands are made from porcelain, and she has a cloth body and legs. 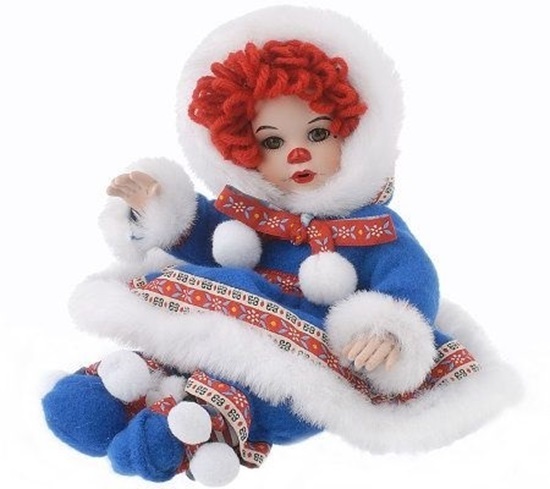 Her hair is made from a red yarn, and she has brown eyes. She comes with a certificate of authenticity, and has Marie's facsimile signature on the back of her neck. A Marie Osmond necklace is also included.